I love buttons! I have had a great button stash for a long time thanks to my mom and my grandmas. I pinned this bingo card recently from cdiannezweig with a plan to do something like it. Like here for styrofoam button Easter eggs. Or here at Christmas for grubby (work shirt type) button trees. Or here as framed button trees and a snowman. I also use buttons in jars as decor all the time. Here, in a sewing vignette. And here in a Valentine's Day mantel. 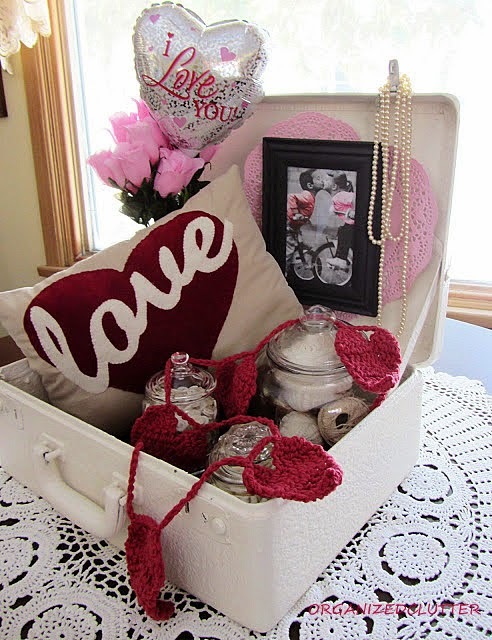 Sometimes I stick jars of buttons in a suitcase vignette. I also used red buttons in a heart pan mosaic. 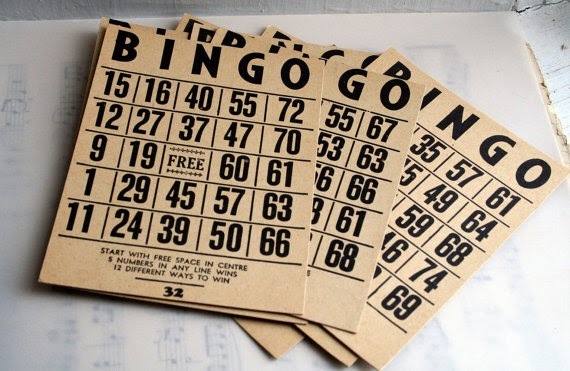 I found Bingo cards like these from the Decadence Emporium on Etsy. Ten for eight dollars. I found thin wood rectangles almost the size of the bingo cards at Michael's. I stained them with walnut stain and brushed them with water based matte poly. I sewed buttons on each card. I brushed on Mod Podge with a foam brush. Then glued them on each wooden rectangle. Here is my white button card. More Hodgepodge. I think I like hodepodge best. More hodgepodge with assorted buttons. Then I picked up a rusty little lag screw drawer. Cool, rusty, but a little too orange. So I sanded the orange paint a lot. Then brushed on some water based poly. Much better! A little rusty and fun. I think my bingo button cards are pretty fun in the lag screw drawer. Or in a wire basket too. I love BUTTONS! Do you? Cute way to display your collection! I love buttons too and love them sewn on the Bingo cards! I think I'll be doing this with some of my old buttons. OH YES...this post is right up my alley...pure eye candy to me! Carlene, I love buttons and this is such a great way to display them. I can see them hung on a wall as a grouping also! I'm pinning this inspiration!! I love your bingo car buttons. I have one question. In the sewing vignette--did you make the container that holds the scissors? I love that! Just thought I'd make one if you had made it and you had a tutorial for it. Yes, I love buttons too, but mine are all stashed in boxes ... love how you are using yours ... great way to have them out to enjoy. Displaying them in the wire basket looks great. 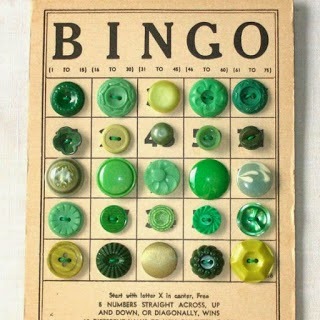 Love the buttons on the bingo cards...so cute!! Yes...I love buttons too. 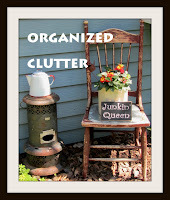 I have several jars full of them in my sewing/craft room.